Dr Chantal Kobel is a postdoctoral O’Donovan scholar in the School of Celtic Studies, Dublin Institute for Advanced Studies. Her current project involves the editing of a series of obscure texts preserved in the late medieval composite manuscript TCD H.3.18 (1337), for which she is also producing a descriptive catalogue of its contents. Dr Kobel lectures in palaeography at the Department of Early Irish, Maynooth University. Insular script, to which the Irish hand belongs, was developed from Roman uncial with a few variations into majuscule half-uncial and this was used to write Latin liturgical and biblical manuscripts in ecclesiastical scriptoria in Ireland and continental Europe from the sixth century onwards. Once majuscule was established in Ireland, and written more quickly, minuscule was developed, which drew upon cursive half-uncial. Both of these styles were used from the middle of the seventh century but minuscule script eventually replaced majuscule as the standard Irish script used in ordinary books. Before the Anglo-Norman period, only three compendia, all fragmentary though substantial, survive that are written in Irish and in minuscule script. These sources, dating from the sixth century onwards, together with the great books of the later medieval Irish period are invaluable for the study of Ireland’s literature, history, law, culture and language. Since the world of medieval Irish manuscripts is connected to reading medieval Latin and Irish, learning and indeed teaching palaeography requires a holistic attitude which involves not only learning the script but also giving consideration to the language, the material and intellectual culture in which the manuscripts were produced. I am in a privileged position to be able to teach this visually engaging and interactive subject, and my approach to teaching the Irish hand is by a combination of theory and practice, practice and more practice! I train students to transcribe, for example, the Insular half-uncial or ‘majuscule’ script in the late sixth-century little psalter known as the Cathach of St Columba (RIA MS 12 R 33), the beautiful script by the skilled hands of the Book of Kells (TCD MS 58) and stately majuscule of the Psalter of St Caimín (UCD OFM MS A 1), dated to c. 1000, which contains a copy of the Liber Hymnorum (‘Book of Hymns’). Another copy of the Liber Hymnorum is preserved in UCD OFM MS A 2, dated to c. 1100, written in minuscule. Both of these manuscripts derive from a common exemplar and contain some of the earliest extant hymns in the vernacular language, e.g. the ninth-century Brigit bé bithmaith. UCD OFM MS A 2, p. 39. The hymn begins with a beautiful zoomorphic and rubricated, large ‘ribbon style’ initial B. The scribal comment in the left margin is an etymological gloss on the name Brigit. Written above the hymn is the introductory commentary, written in a compact miniscule. Image courtesy of ISOS. The Irish hand is notable for its scribal compendia, abbreviations, notae antiquae (‘suspensions’) and ligatures and students must familiarise themselves and learn these in order to decipher and transcribe the script; much to the chagrin of a beginner to palaeography! Latin abbreviations were used not only to represent Latin spellings, but also in an Irish context for the Irish equivalent, like the Tironian note 7 = Latin et ‘and’, ocus ‘and’ or the syllable et in Irish. The letter q with a cross-stroke through the descending shaft stands for quia in a Latin context but in Irish it stands for the preposition ar ‘for, since’ and for this group of letters in any combination. Moreover, nomina sacra (‘sacred names’), some derived from Greek such as ih̅c ‘Iesus’ and xp̅c ‘Christus’, are abbreviated by contraction, also causing students consternation. In addition to learning these, I encourage students to pay attention to the angle at which a pen is held, whether it is upright, forward-leaning or backward-leaning as this affects the script and the general aspect and rotundity, whether it is angular or round. I get students to transcribe passages in the classroom under my close supervision. In this environment students can troubleshoot and discuss any difficulties they may encounter. Such discussions have the added advantage that students become comfortable with using the correct palaeographical terminology needed to describe the essential components that a letter has to make it recognisable as such. For example, the letter p consists of a bow and a descender and the letter i consists of a minim. For many of the students it is their first encounter with the Old Irish language (c. 700–900), so I like to introduce them to the mid-ninth century copy of Priscian’s Institutiones Grammaticae. It is written in clear and legible minuscule script and has many elaborate initials which are visually appealing to the student. The main text is in Latin and is annotated by several hands, containing over 9000 glosses, of which some 3478 are in Old Irish, including scribal marginal comments and poems written in Old Irish. St. Gallen, Stiftsbibliothek, Cod. Sang. 904, p. 203. At the bottom of the page is the Old Irish marginal poem Domḟarcai fidbaide fál ‘A woodland hedge overlooks me’ (see Thes Pal. ii, 290.8). The pricking marks are visible along the edge of the pages. The scribes used construe marks to guide the reader from gloss to the relevant word or phrase in the main text, or vice versa. Image courtesy of E-Codices: Virtual Manuscript Library of Switzerland. In order to contextualise the script within its physical manuscript, I also introduce students to the fundamental aspects of codicology, focusing on the materials and methods of the medieval Irish book-maker. For example, the preparation of the vellum (calf-skin); the arrangement of the sheets into a quaternion (caitirne) or quinion (cín, borrowed from Latin quinio); the pricking and ruling of the sheets in preparation for writing; the binding of the book; the making of pens and the natural sources used to make inks. The palaeography of the great medieval Irish codices spanning from the twelfth to the sixteenth centuries, such as Lebor na hUidre, the Book of Leinster, the Book of Ballymote, the Yellow Book of Lecan and An Leabhar Breac (‘the Speckled Book’) is the focus of the module ‘Palaeography and Manuscript Culture’. These important codices are written predominantly in the Irish language and in minuscule script, although a large script is still used to lend authority to a text as well as differentiating the authoritative or canonical text from the surrounding commentary and glossing. TCD MS H.3.18 (1338) is a sixteenth-century manuscript containing legal-tracts, glossaries and other genres of texts of interest to the medieval Brehon lawyers. Here on p. 53 is the opening page of the ‘Cauldron of Poesy’, an Old Irish text concerning poetics. The main text is written in a larger display script with the glosses in smaller miniscule. For an edition and translation, see Liam Breatnach, ‘The Caldron of Poesy’, Ériu 32 (1981), 45–93. Image courtesy of the Board of Trinity College Dublin. Therefore, I stress to students the importance of paying attention to the manuscript’s visual layout which can enhance our understanding of scribal intention and the reception of a text. Marginalia and scribal colophons inform us as to when and where a manuscript was written or compiled and give insights into the working conditions of the scribe or compiler. Moreover, these also inform us of the later provenance of a manuscript. Seeing a manuscript in person provides a tangible link to the medieval past and gives an appreciation for the physical appeal of a manuscript. Indeed, I still vividly remember my first encounter with the magnificent twelfth-century vellum manuscript Lebor na hUidre, which was laid out ceremonially in the Royal Irish Academy Library, getting chills whilst staring at the opening page of Táin Bó Cúailnge (‘The Cattle-Raid of Cooley’), a text which I was reading and translating from the printed edition as an undergraduate. Similarly, I bring the students to visit a research library where the students receive a masterclass from the librarian and they can view, read and examine medieval Irish books in a supervised setting. A trip to the Royal Irish Academy Library. Students were able to get up close and personal with the iconic and important 14th-century manuscript Book of Ballymote (RIA MS 23 P 12). They were impressed by the sheer bulk of the manuscript, something which cannot be gauged from a digital image! The study of Irish palaeography and manuscript culture has been greatly advanced by the availability of high-resolution digital images of manuscripts. These allow the researcher or student to zoom in and view the script and material in closer detail, and frequently one sees things which are not visible to the naked eye, such as hair-strokes and length-marks. Long gone are the days of illegible and dark photocopies of photo-stats and microfilms from which students had to transcribe (students today don’t know how spoilt they are!). However, I stress to the students that the digital image is no replacement for the original, which must always be consulted at some stage whilst editing a text. 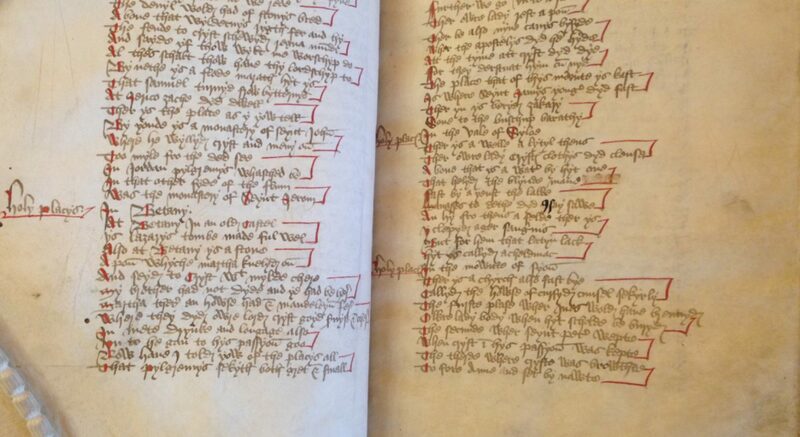 Apart from gaining a close-up of the script, students can identify physical aspects such as dry-ruling, pricking marks, holes in the vellum, medieval scribal repairs, quality and colour of ink, etc. The go-to resource for digitised Irish manuscripts is Irish Script On Screen, run by the School of Celtic Studies, Dublin Institute for Advanced Studies. I encourage students to apply for a password which allows them to zoom-in on the high-resolution digital images. Other fantastic resources for viewing Irish manuscripts include E-Codices and the digitised images of the Irish manuscripts held in the Bodleian Library, Oxford University. I always refer students to, amongst other excellent works, The Irish Hand by Timothy O’Neill, in which he gives excellent descriptions of manuscripts and of the scripts. For abbreviations, students can avail of Tionscadal na Nod, ‘The Scribal Abbreviation Project’. Ultimately, learning how to transcribe the Irish hand, as with any other script, requires practice, practice and more practice (my students quickly get bored of me saying this!). But with time and perseverance the Irish hand and the medieval manuscripts become much more accessible to them, much to my delight! For a detailed overview of the Irish hand and the manuscript sources written in this script from the mid-sixth to c.1100, see William O’Sullivan, ‘Manuscripts and palaeography’, in Dáibhí Ó Cróinín (ed. ), A New History of Ireland: I Prehistoric and Early Ireland (2005, Oxford), 511–548. See also Bernhard Bischoff, Latin Palaeography: Antiquity and the Middle Ages, translated by Dáibhí Ó Cróinín and David Ganz (2009, Cambridge), esp. 83–90. These are dated to c. twelfth century, namely Lebor na hUidre ‘The Book of the Dun Cow’ (RIA MS 23 E 25), the Book of Leinster (TCD MS H.2.18 (1339)) and Oxford, Bodleian Library MS Rawlinson B 502. Edited and translated by Whitley Stokes and John Strachan, Thesaurus Palaeohibernicus: a Collection of Old-Irish Glosses, Scholia, Prose, and Verse, 3 vols, vol. ii (1903, Cambridge), 325–326. For a discussion and collection of such marginalia, see Charles Plummer, ‘On the colophons and marginalia of Irish scribes’, Proceedings of the British Academy 12 (1926), 11–44. O’Neill, Timothy O’Neill, The Irish Hand: Scribes and Their Manuscripts from the Earliest Times (2014, Cork).